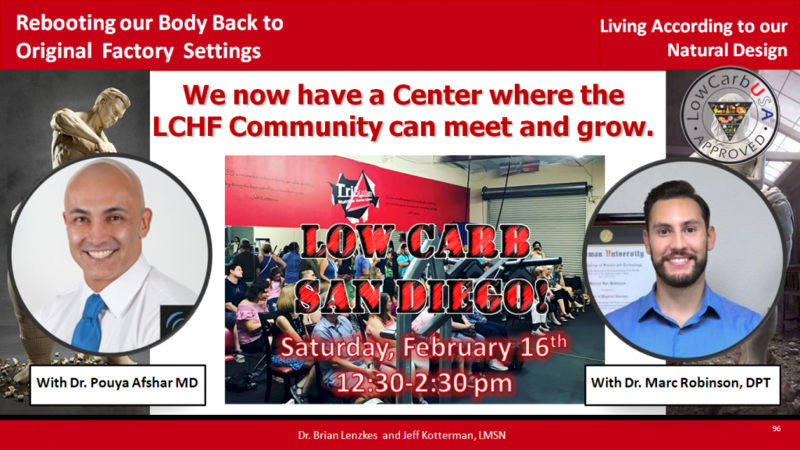 The San Diego, Ca “chapter” of the Low Carb USA group is having its tomorrow on Saturday, April 13th, 2019 from 12:30-2:00 pm. All are welcome to this free meeting of those interested in the low carb high fat lifestyle. Keto friendly and intermittent fasting vendors, resources and support for our community will be there! This will be another great meeting with featured speakers. We will have the vendors in the reception area and the speakers on the exercise floor and it will be comfortable! 12:30 pm – Welcome from Jeff, Rachel, and Brian. As Always –Our Preferred Vendors will be there selling their products. 12:35 – 1:05 pm –Jeff Kotterman. LMSN will give a brief summary of recent research, metrics and markers of progressing on a ketogenic regimen. 1:05 – 1:20 pm – Dr. Marc Robinson DPT, will talk about the multifaceted benefits of preventative care or “Evercore Pre-hab”, a way to lessen predisposition to injury and greatly reduce severity of injuries when they happen and improve recovery time. A low carb/ketogenic diet will work well with both acute and preventative physical therapy. 1:20 -1:50 pm – Michelle Mitchell – wellness coach, uses 25 years of experience in leadership blended with teaching mindfulness to talk about how to be more successful in staying ketogenic and navigating through temptation and bad habits . Her journey has been all-encompassing, from the Department of the Navy to the Beauty Industry. 1:50 – 2:00 pm Close of meeting and mixing with vendors and speakers. Dr. Brian Lenzkes is available for professional private consultations. Doug Reynolds and Pam Devine with Low Carb USA are away and will be at the next meeting! *If you are a regular, we appreciate you helping at 2:00 pm to help clean up chairs and tables. It includes a 5 part video series featuring Dr. Brian Lenzkes and Jeff Kotterman with commentary from Doug Reynolds in the audience. Click on the link to get your free access! 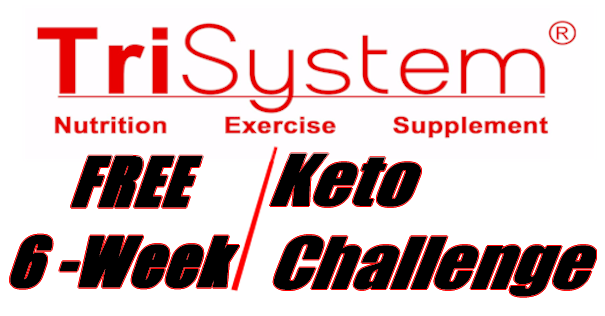 The TriSystem Health Network is looking for that one special person to lead our New TriSystem 6 week Keto Challenge. 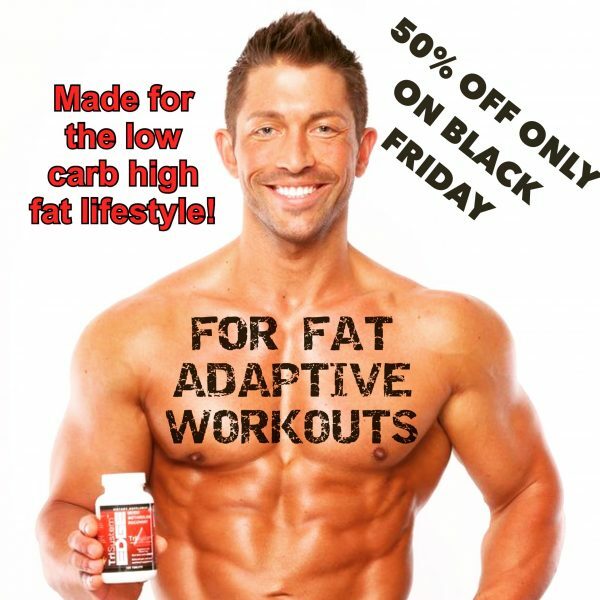 This comprehensive low carb/high fat program rewards you for your progress! It includes our unique clinical assessment, individualized nutrition and dynamic training sessions scheduled at different times. It includes an accountability coaching and progress checks. This unique proven program is changing lives and we need a leader to supervise its growth! We are currently interviewing applicants who want to take their fitness career to the next level. 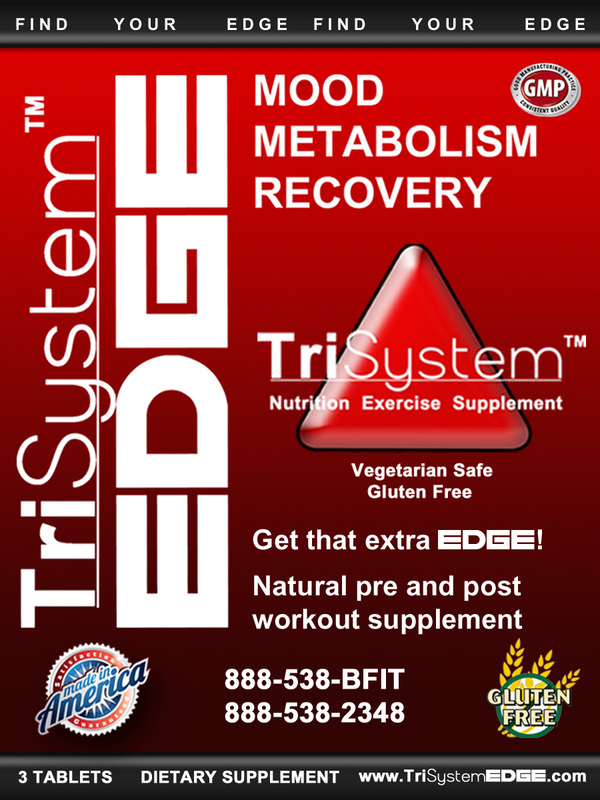 Please email your resume to jeff@trisystem.com . 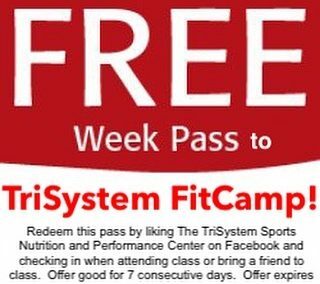 This new, separate program at the TriSystem Center in San Diego, Ca is past the test phase and is ready to launch in the next 30 days and will have a period of growth and development. Those interested will be responsible for the whole program including initial assessment, sales, reviewing program binders, and training, encouraging and assisting as an accountability coach. The TriSystem Challenge Manager will be trained in a coaching and sales process that will drive the program to grow and expand to increase membership and its support by more team members as needed. Average expected part time income is $1000-1500 with plenty of opportunity to increase as the program grows. Our CM will make $30 per 30 minute group session, $30 per hr. for one to one training and 10% commission in sales as a private contractor. Have interest in growing the TriSystem Challenge group eventually managing other trainers, focusing on increasing membership and retention. 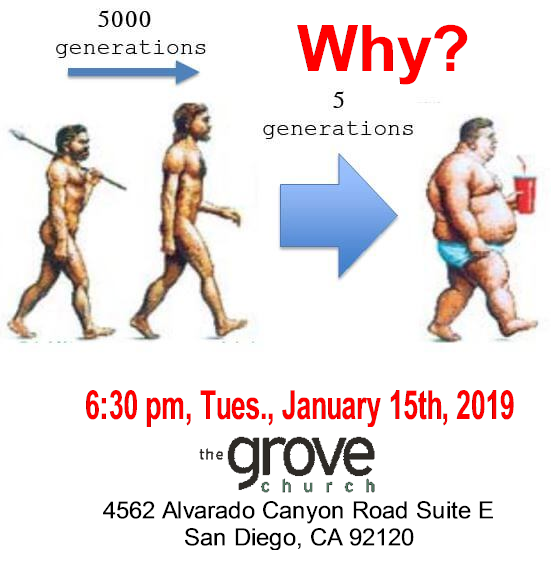 The San Diego, Ca “chapter” of the Low Carb USA group is having its next meeting on Saturday, February 16th, 2019 from 12:30-2:00 pm. All are welcome to this free meeting of those interested in the low carb high fat lifestyle. Keto friendly and intermittent fasting vendors, resources and support for our community will be there! This will be another great meeting with 2 featured speakers. We will have the vendors in the reception area and the speakers on the exercise floor and it will be comfortable! 12:35 – 1:05 pm – Dr. Pouya Afshar, MD – an internist in San Diego, California and is affiliated with multiple hospitals in the area. He received his medical degree from University of Texas Medical Branch and has been in practice over 10 years. Dr. Afshar is on the forefront of revolutionizing emergency medicine and managed care in the home with mobile ER’s and other medical services. 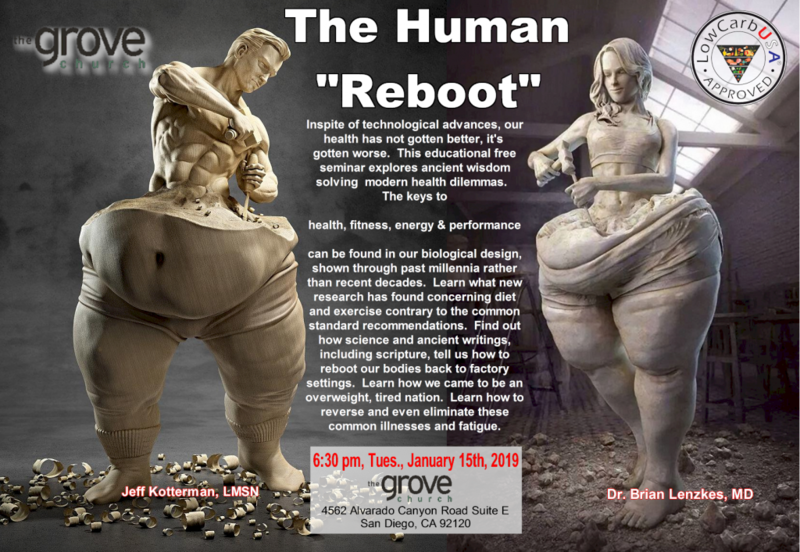 He will be speaking about a solution to the US healthcare problem that embraces ketogenic nutrition and exercise as tools to directly reduce insurance costs. 1:05 – 1:20 pm – Jeff Kotterman. LMSN will give a brief summary of recent research, metrics and markers of progressing on a ketogenic regimen. 1:20 – 1:50 pm – Dr. Marc Robinson DPT, will talk about the multifaceted causes of low back pain and how a low carb/ketogenic diet will work well with both acute and preventative physical therapy. Doug Reynolds and Pam Devine with Low Carb USA will also be there! Find out the answer for free tonight! 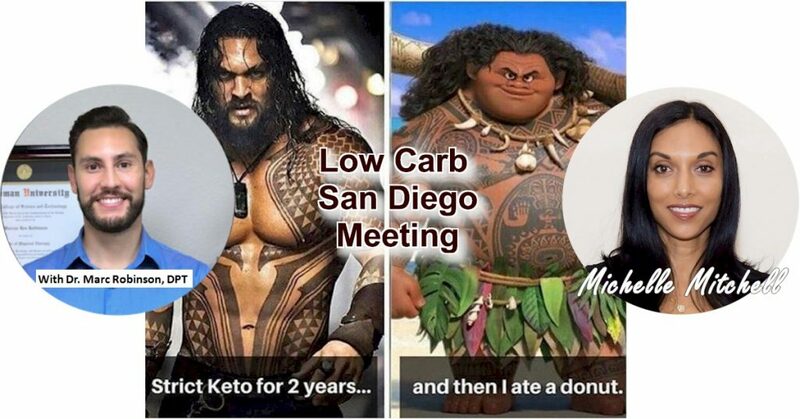 The San Diego, Ca “chapter” of the Low Carb USA group is having its next meeting on Saturday, October 20th from 12:30-2:30 pm. All are welcome to this free meeting of those interested in the low carb high fat lifestyle. Keto friendly and intermittent fasting vendors, resources and support for our community will all be there! This will be another great meeting over 50 people expected to come. We will have the vendors in the reception area and the speakers on the exercise floor and it will be AIR CONDITIONED! As Always –Our Vendors will be there selling their products. 12:35 – 1:00 pm Kate Stokes publisher, aims to connect San Diego County residents with local growers, retailers, chefs, and food artisans, while telling the stories of San Diego County’s diverse regional food system through her magazine, website, social media platforms, and events. 25 years of experience in leadership blended with my love for meditation to teach mindfulness. Her journey has been all-encompassing, from the Department of the Navy to the Beauty Industry. 1:30 – 2:00 pm Our Featured Speaker: Dr. Brian Lenzkes Presents the process of getting off prescription drugs. He will share his plan, procedures and experience with his patients since starting to reduce prescribed medications. 2:10 -2:20 pm Jeff Kotterman will be offering sign ups for the new Dr. Ben S.Ma.R.T. 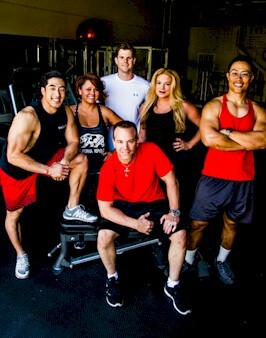 small group Personal training sessions and one-to-one Medical consultations with Dr. Brian Lenzkes.